When Leon and I went on our first trip to Italy in 2012, we accompanied a group of other PBS-loving strangers on a two-week whirl through Venice, Florence, and Rome. I’m glad we did, and not just because our tour allowed us to float past crowds into the Vatican, stream through lines into the Duomo, and brush past queues at St. Mark’s Place — though I totally loved that bit. Of course, I’m glad we did for a million reasons not pertaining to long lines, but particularly because one afternoon in Florence, we and our fellow PBS lovers donned clear plastic aprons, washed our hands vigorously, and took a cooking lesson from a bright-eyed Italian wag who taught us to make fresh pasta from scratch. I have to admit, while standing in that Florentine kitchen, that my immediate middle-aged posture was one of a disaffected teen — all studied ennui. Once in my embarrassing plastic garb, one of my hips dropped impatiently, a hand went to the other hip, and I might as well having been chewing gum, my mouth opened so often with disdain. My tour companions looked so dumb and old! I hope, I thought, I die-die-die before that happens to me. Then I caught sight of myself in a polished steel refrigerator door. Oh, right. I don’t hope I die, I don’t hope I die. Turns out, I’m no longer 17. I’m just like them, and, just like them, am thrilled to be on a PBS lovers’ tour of Italy about to make pasta. Which happens to be the one of easiest bloody things to do in the world. The trick with pasta, our Italian Wag instructed, is to take out the liquid you put in. Perhaps it’s the same with pie crust. I wouldn’t know. I’ve been adding cold vodka and frozen orange juice concentrate, iced eggs and frozen water to failed crusts for so many decades that I’ve lost count. We each took turns tipping a sacred amount of water into the Semolina to gently incorporate. The flour, which is rough like sand, slowly drank it in. “Now you knead,” he said, using his palm to push the water from what was quickly becoming a pliable dough. “Now you rest,” he said with a smile, wrapping the dough in plastic, placing it in that damned mirror-like fridge, and instructing us that it was time for wine. There wasn’t a PBS lover among us who didn’t like to hear that command. After a glass and a rest, the dough was ready to transform into pasta and the Wellness 150 — or at least, its industrial cousin— was introduced. You may have owned this pasta machine in the ’80s. I know that I did. There was a bit of a tear on about them then. 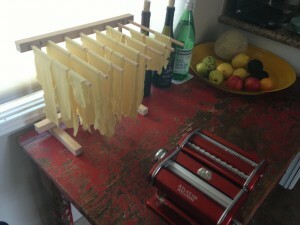 My best friend and I each bought one, determined to feed our young families the healthy richness of fresh pasta. We met one day at her house to try it, each of us garbed in fresh linen dresses and updos as though the afternoon were some kind of real-life Tampon ad. She did it gracefully, mounding the flour and deftly mixing the dough. I did it clumsily, spilling flour all over the floor, smearing my fresh linen dress, and then, most unhappily, foolishly washing my Wellness 150 in water. Water and Wellness must never meet. My pasta machine dried hard and rusty, deeming it fit only for the darkest, most inaccessible kitchen cupboard from which it was finally rescued and unceremoniously dumped one day when my babies had turned into middle-schoolers. This time was going to be different. I wasn’t some ennui-drunk adolescent, I wasn’t even a new mother trying to feed a young family some healthy richness. I was a middle-aged PBS lover who now knew how to make pasta. And dammit, I was going to. Arriving home from Italy, Leon and I soon went to the local fancy culinary store. My Wellness 150 awaited, red and chic and the only model in the store. We brought it home, clamped it onto a table, dusted it with Semolina to “clean” it, and began our Great Pasta Experiment. Truth be told, it’s not much of an experiment. I haven’t yet tried ravioli or anything folded and tucked or stuffed. But fettuccine? Yes ma’am. Lots of it. And I’ve found that lasagna noodles are far more succulent and melty when made fresh than when boiled up from their cardboard box. Best of all? Homemade pasta is forgiving. Mine always looks like hell when it’s hanging from my $15 fancy store rack and looks like heaven when streamed into a colander after cooking. Plus, no one understands how easy this congregation of flour and water really is. Maybe you have to be middle-aged to enjoy it. Perhaps public television helps. I doubt it. It’s really about scant. Mound the flour like a small temple on a clean cutting board. Slowly add tiny amounts of water, incorporating it into the flour as you go. The dough should hold together just barely. For ease, break into two balls. Begin kneading, thinking of getting the water out of the dough, using the base of your palm. It takes less than five minutes. The dough should have a velvety texture with none of the sand-like roughness of the flour itself. Wrap each ball in plastic and let rest at least 30 minutes in the refrigerator. Remove the balls from the fridge and, using a knife, slice several nice circles until the pasta is cut up. Set your Wellness 150 at zero and use the handle to crank the slices of dough through. Advance to numbers two, then four, then six, then eight, cranking the same piece of dough through until it is as thin as you desire. You may have to cut the dough into pieces as it elongates. Go ahead and do that. **I flatten all my dough first and then put it through the cutting setting of my Wellness 150. You probably have a more elegant method. Go ahead and do that. Let the cut pasta dry in a rack or on a floured baking sheet for at least 30 minutes. Prepare a pot of salted water and set to boil. Once at a rolling boil, add your noodles. Cook five minutes or less; it should be al dente, toothsome to the mouth. Reserve some of the pasta water to thin your sauce if you like, and drain. Prepare to receive all kinds of uncanny accolades. Chuckle to yourself gently.